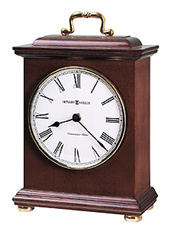 This bracket-style clock brings charm to any shelf or mantel. It features a decorative brass-finished handle, polished brass finished bezel, and turned, polished brass bun feet. An off-white dial under convex glass features black Roman numerals and black hands. Quartz movement plays Westminster chimes on the hour.